You can set the exact location of the property on the map in this panel and you can output the related street view. Simply drag the marker to the required position. When you have made any adjustments to either the map or to Street view, press the save icon to save your changes. You can drag the street view window around with your mouse to identify the actual property for sale. Once you have the street view window correctly positioned, you may wish to bring the map into line. Click this icon moves the map. You may want to position the marker on the map by dragging it around. 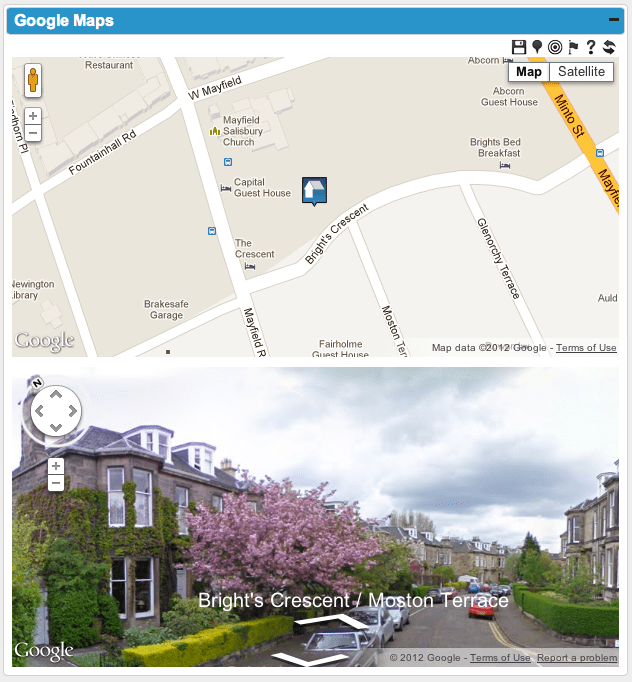 Once it is in the correct location you can click this icon to bring the street view window in to line with the map. Clicking this icon moves the street view window while the map stays static. If you prefer a satellite view instead of a map, simply change the Google Maps view to Satellite and save. This will display the satellite image in your website instead of the map.